School bus aide Carletta Cyrus and driver Tammy Cummings are being heralded for their actions after a semi-truck lost control and hit their vehicle with four special needs students on board. 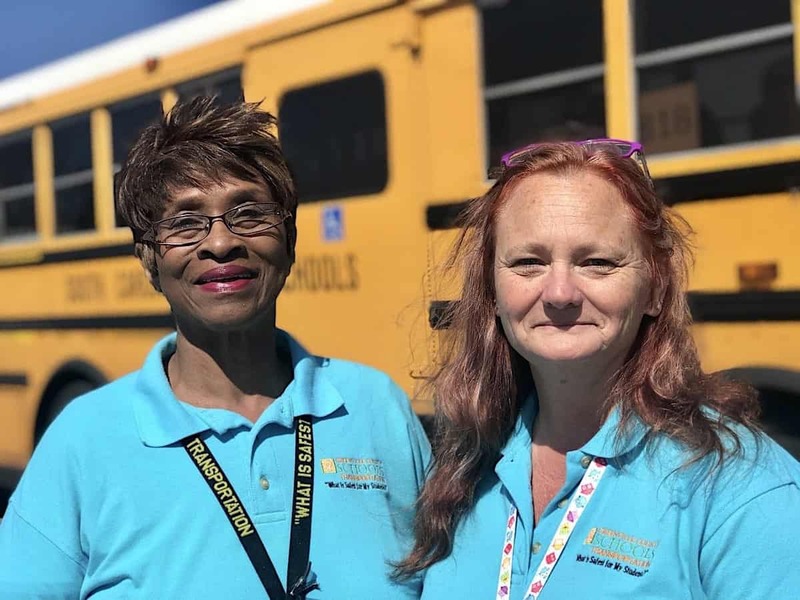 A South Carolina school bus driver and aide are being praised for taking charge and calming students after their special needs bus was hit by a semi-truck. Video released by Greenville County Schools, and available for viewing below, shows the incident that occured on March 20. A semi-truck skidded off the road into the grass, veered back onto the road and jack-knifed in front of the oncoming school bus. The trailer hit the right front side of the bus and toppled a utility pole. A live power line fell on top of the school bus as a result. School bus driver Tammy Cummings later said that her training “immediately” kicked in. She maintained control of the bus upon seeing the semi veer across her lane and slowed the bus to a stop. Immediately after the collision, she radioed dispatch for an ambulance and fire truck to deal with the downed power line, then walked to the rear of the bus to assist her onboard attendant in calming the four special needs students who were onboard. “I secured the bus, made sure that the area was clear and that there was going to be no more accidents, that my aide and my children were okay,” she remembered. Mitchell said that there were no injuries thanks to Cummings’ quick thinking. The driver is also a member of the district’s special needs training team, and is skilled at properly securing the children in their wheelchairs and safety vests. The video shows Cummings and Cyrus calming the students, some of whom are crying. Cummings maintained a cheerful demeanor and distracted one student by getting him to show her what games he had on his cell phone. “Both knew the students and what the students responded to, therefore giving them the tools to redirect the attention of the students from the dramatic scene developing around them, to a comfort zone for the students,” Mitchell explained. Parents of children on the bus praised Cummings and Cyrus for minimizing the danger and then caring for the students so well. “I am truly blessed, and all the children are blessed. They’re in good health. And my driver was excellent,” said Cyrus. She advised other school bus aides to study from and learn the training manual provided by their district “like another Bible” and to “keep a full communication” with their driver. “So, both of you can blend in and have communication and know how each other thinks when something happens like this,” she explained.